Blyth Spartans have re-signed former goalkeeper Peter Jeffries and midfielder Stephen Turnbull. Twenty-nine-year-old keeper Jeffries agreed to a return to Croft Park following a spell with Consett. Blyth manager Tom Wade said: “Peter is top signing for us. It’s a sign of our intent for the coming season. “Other clubs were in for Peter but I’m very pleased he decided to return to Blyth. “He’s a very experienced player who will help out a young back four. He dominates his box and is a bit of a legend at the club after the 2014-15 FA Cup run. “We now have two fantastic keepers at the club – Peter and Adam McHugh fighting for the number one shirt. Meanwhile midfielder Stephen Turnbull has also rejoined Spartans for the 2016-17 season following a spell at sea as part of a training programme. Turnbull said: “I’m absolutely delighted to be back at Blyth. I’m really buzzing and can’t wait for next season. 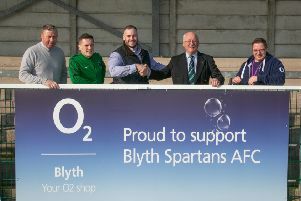 Turnbull followed Blyth’s progress during the second half of the season whilst at sea. “My brother Phil and my girlfriend kept me in touch, and my Dad went to the Workington play-off game and the Northumberland Senior Cup Final. I was gutted by those two results. “Football can be so unjust sometimes when you think about where we finished in the league and the club records we broke. “But we have to forget last season now, not even talk about it. Everyone needs to be positive and I’m convinced we’ll do really well next time round. The 29-year-old Steve had spoken to South Shields and Spennymoor before signing for Blyth, but he said there was only one place he was going to end up – at Croft Park. “Shields is my home town but I spoke to Tom [Wade] and it was Blyth for me,” he said. “I love playing football for Spartans. I love the fans and I think they like me.